Windows 10 Slow Internet Issues & Fixes - Why Is My Internet So Slow? “Why is my internet so slow?” is a question that we hear often. Since Microsoft handed out Windows 10 for free, it goes like how to increase internet speed on Windows 10? Hence, in this article, we explain why your internet is slow, how to speed up your internet connection, and more. Here’s how to fix Windows 10 slow internet problems. Bandwidth intensive tasks (video streaming, downloads, etc.). Internet plan offers low bandwidth. To address the above issues. Are you on WiFi? Then try moving closer to the router to get the best signal. Do you stream HD videos, download large files, or play bandwidth intensive games? Then, it is best to expect lag on other devices connected to the same internet connection. Also, you are better off leaving the download to run overnight whilst you sleep. Check with your Internet Service Provider (ISP). Ask them what amount of bandwidth they offer for download and upload. If you plan only includes 25 Mbs download then consider upgrading to something more. You can check your connection’s download speed at fast.com. However, if your Windows 10 slow internet issues persist, here’s what else you can do. The first thing you want to do is check that peer to peer update is not in effect on your computer. Secondly, you need to monitor and shut down some background applications. 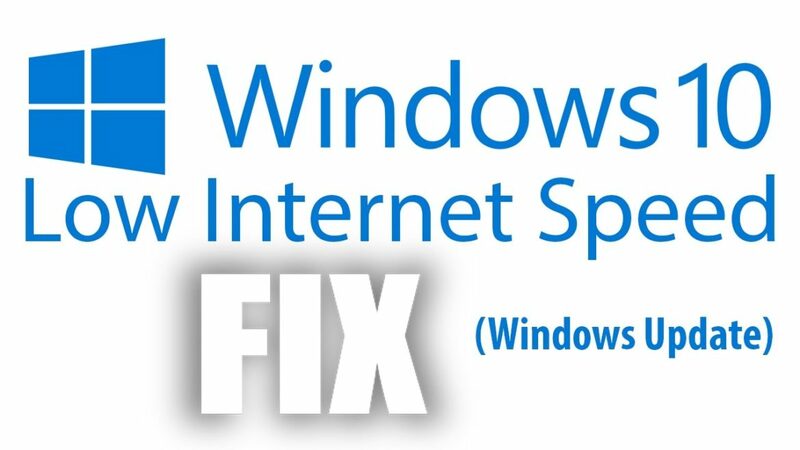 Thirdly, you may need to modify Windows Update settings to make your internet faster. Also, get rid of OneNote & uninstall OneDrive. Other solutions include disabling Large Send Offload, your FireWall (third-party), Windows Auto-Tuning, updating your Network drivers and, lastly, adjusting your bandwidth settings. Let’s look at each solution a bit more in-depth. Note, please restart your computer after each adjustment/fix (it’s a hassle, I know…). How Do I Get Rid Of OneDrive? What To Do To Fix HDMI Sound? Brightness Control Won’t Work. How To Fix? Firstly, click Start and type Settings to open it. Next, select Update and Security. In the menu that appears, click Choose How Updates are Installed. Lastly, click the toggle to turn off peer to peer update under Allow downloads from other PCs. Do you run apps like Skype, Spotify, or Netflix? Then, these apps may run in the background after you close them. While this occurs, they use up your bandwidth. Hence, your internet connection slows down. Here’s what you can do to prevent this. Here, in the menu, click the Performance tab. Then, select Open Resource Monitor. Finally, click the Network Tab to view which applications use the most bandwidth. Once you know which apps use the most of your bandwidth, you can then stop them from running in the background once you close them. Click Start and open the Settings app. In this section, locate and open Background apps. Lastly, in the list of apps that appear, click the toggle to disable the apps that use the most bandwidth. Ok. You do not need to disable Windows Update. You need it for important bug fixes and whatnot. However, you can choose to manually install the update at a time that is more convenient to you. For example, during the hours you sleep. Click start and launch the Control Panel. Then, scroll down to Windows Update. Right-click on Windows Update, and then select Properties. Lastly, select Manual to install updates manually instead of Automatically. First, open your Start menu and search for PowerShell. Next, right click on the app and then choose to Run as administrator. Lastly, copy-paste the below command and hit enter. Firstly, click the start button and right-click This PC. In the left-hand side, click Device Manager. Click Network Adapters to expand. Then, double-click your computer’s Network card. Lastly, select the Advanced tab and then select Large Send Offload V2 (IPv4). Set the value to Off. You may also set the value to off for the IPV6 option if it appears on the menu. Once complete, click OK to save the changes. The next thing you can do is turn off third-party firewall services. Some third-party firewall services like AVG may interfere with your connection speed. If you have any such service installed, try disabling the firewall and then check your connection. If it improves, then you can safely say that the firewall causes problems. Why not use the default Windows Defender and Firewall by Microsoft? Is There A Way To Use iMessage On Windows PC? How To Automatically Close Applications When I Shutdown Windows? What Does One Or More Network Protocols Missing Mean? Is There A Way To Fix DNS Server Unavailable Error? Firstly, press and the Windows Key+ X. Then, select command prompt admin or Windows PowerShell (admin). A list appears. Look at the list for Receive Window Auto-Tuning Level. Is it set to normal? Then, you may want to disable it. Type netsh int tcp set global autotuninglevel=disabled and hit enter to disable it. On a side note, you can use netsh int tcp set global autotuninglevel=normal to re-enable the feature at any time.And, for your reading, some persons advise not to disable the feature. This is a simple method. All you need to do is go to your computer’s manufacturer’s page to check for driver updates. If there are any, download and install all the necessary updates for your computer’s drivers. Firstly, press the Windows key+R. Then, type gpedit.msc in the search box and then press OK. The Group Policy interface appears. Click Computer Configuration (in the left-hand corner). Then, go to Administrative Templates, then Network, and finally QoS Packet Scheduler. Here, click on Limit reservable bandwidth. Lastly, in the interface that appears, first choose Enabled and then change the Bandwidth limit (%) from 100 to 0. That’s all the tips we have. Hopefully, you can say goodbye to your Windows 10 slow internet issues once and for all. Also, most of the tips work for other versions of Windows. What Is IPV6 & Can I Disable It? Is There A Way To Auto Sign Into Windows 10? Can I Delete Windows 10 Action Center? How Do I Downgrade Back To Windows 7? Why Does Windows Modules Installer Worker Have Such High Disk Usage?